So famous, even the game itself references it. Other popular Monde Greens include "Hands off my bread! ", "Too easy, pizza-cake! ", "Falcon Thrust!" and "Landbastard!" Falco: PERSONALLY, I PREFER THE AIR Your Mom! Ike's "I FIGHT FOR MY FRIENDS". "NOW I'LL SHOW YOU-DAMN IT!!!!" The other taunt, "COME ON! STEP IT UP!" gets this a lot too. Within the Sonic boards, Winning Steak (based on a misspelling of "owning streak"). Also, Sonic was once considered the fifth-worst character in the game. Now a handful of players are calling for a move to high tier. And justifiably so (YMMV). Related: the "miracle at MLG", in which two of Sonic's best players got fifth and sixth at what might be the biggest smash tournament ever. Almost the entirety of Sonic being in Brawl is a meme in and of itself. Certain parts of the Smash Fan Dumb and the Sonic Hate Dumb are at arms with this, and pretend to be in disbelief to Sonic's inclusion in the game, combined with the unexpected success Sonic players have achieved in certain tournaments, as well as the rising of his tier. All layered with the above memes as reasoning. His white costume looking like a wedding dress. ROY'S OUR BOY! ROY'S OUR BOY! WE LIKE IKE! WE LIKE IKE! Well, at least ROY HAS T3H PH1R3! Snake, do you know who that is? I will cut you with my hammer. Even in death. Snake can kill you. Related: Geno. Likely won't ever get in because of copyright issues with Square, but still a very common request. 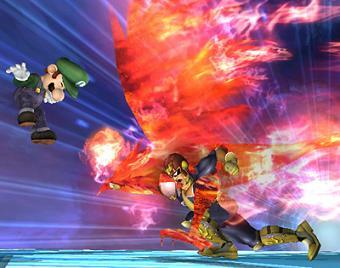 ↑ Captain Falcon's over-the-top Megaton Punch. So famous the F-Zero anime included it in a spectacular Heroic Sacrifice. Arguably the most famous meme from the game. ↑ One of Captain Falcon's taunts has him saying, "Show me your moves! ", but either because he couldn't be heard clearly because of the accent, or because players really were that immature... yeah, it was kind of inevitable. It is probably the series' best-known taunt. ↑ How casual players think competitive players treat the game. Fox and Final Destination aren't used nearly as much as this meme suggests, and the only truth in it is that competitive players never use items. ↑ Referred to Sakurai's daily blog leading up to the release of Brawl, in which he'd detail new features of the game. ↑ The reaction to the above when fans were outraged over absent characters and other frustrating features. ↑ And the counter-reaction. Comes from many interviews with Satoru Iwata in his "Iwata Asks" column, wherein every chuckle from anyone present is meticulously recorded as shown ad nauseum. One of these columns happened to involve an interview with Sakurai, popularizing the oddity. ↑ Johns=Excuse. People take this and run away with it. ↑ Advice from Isai, one of the top players, for getting better at the game. ↑ Used as both wishing for a certain character to be included as well as a joke about the massive number of available characters. Continues even after Brawl was released. ↑ One of Sonic's taunts. Spammed endlessly by players that dash across the stage and can't be hit. ↑ Sonic shouts the first phrase upon activating his Final Smash, Super Sonic. He then continuously yells the second phrase during the Final Smash. ↑ Many people noticed Marth's flamboyant appearance and the fact that he wears a tiara. ↑ Based on a famous moveset-swapping hack for Brawl. A video featuring the moveswap was featured shortly after the game came out. ↑ What the Large Ham announcer says after the opening cinematic of Melee. ↑ One fan's (poorly spelled) objection to the insistence that each character can be put into a specific tier. ↑ Brawl introduced a mechanic in which characters would randomly trip while running. This was the reaction. ↑ From the official website, a caption from a lesson explaining the tricks of getting back to the stage when knocked off. Many people were frustrated about the update because it didn't give any new information about the game. ↑ Oddly phrased caption while explaining Smash Balls. The original grabber is Link. ↑ After one poster asked how quickly everyone had beaten the 100 Man Brawl, one poster responded with this. ↑ Possible shoot comment from the official website when introducing Stafy/Starfy as an assist trophy. ↑ during a 2v2 match, SS (Fox) and Tang (Falcon) took out Lucky (Fox), and got Zhu (Fox) to his last stock. The two defeated Zhu by performing an extremely difficult and fast combo from zero percent to death in FIVE SECONDS. This managed to impress the commentator Homemade Waffles, and the combo is considered one of the best in all of pro Smash. ↑ A common reasoning on why people think Ridley wasn't playable in Brawl, then it started being used on any suggested character. Mostly on GameFAQs. This despite the fact that Olimar was resized up from smaller than a coin. Not a giant Mario coin, a real life coin. ↑ Originally used with Meta Knight, in a video about him being overpowered. ↑ This cryptic sentence ended the music update post for "Go K.K. Rider!" To this day, nobody is sure what it means. This page was last edited on 20 September 2018, at 22:41.